First, let’s give everyone a voice. For one, half-day, a group of diverse individuals from all backgrounds, all across America, came together in a safe environment to discuss issues facing the profession of architecture, our society and our communities. The open door format of the Equity by Design Hackathon created the right foundation for catalyzing a new mindset. We stripped collaboration of the traditional roles that we each fulfill everyday. We eliminated hierarchy in decision making and we placed all of our thoughts on the table, despite the vulnerability that typically comes with discussions of equity, diversity and inclusion. When you have four hours to work through a solution, you don’t have time to allow yourself to get paralyzed by the complex nature of these issues. Instead, you adopt a new modus operandi: you throw everything against the wall and see what sticks. Not enough communities have access to design services and when they do, it is during times of disaster/in response to disasters. 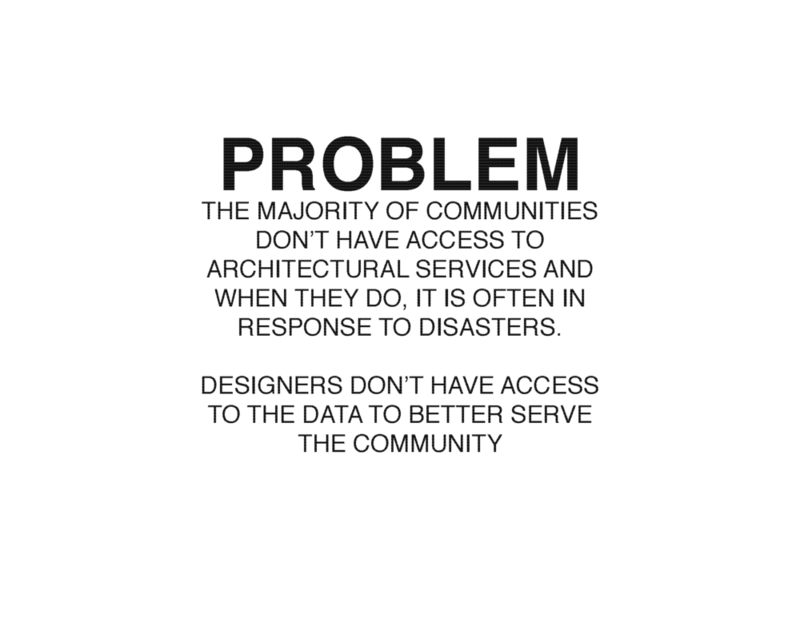 In contrast, designers don’t have access to data that would help them identify what the community actually believes is needed. Our solution would be brilliant in its simplicity. Our goal: to better engage and listen to understand what they believe are the areas of opportunity. It would give a voice to people in local communities who are typically not heard to have a say in how their community develops. To achieve that, we prototyped a software app that would be available on mobile phones as well as local library and school computers to increase access. This app would allow community members to, for example, go out and identify open or vacant parcels and crowdsource votes on what they believe to be the best fit for their needs. 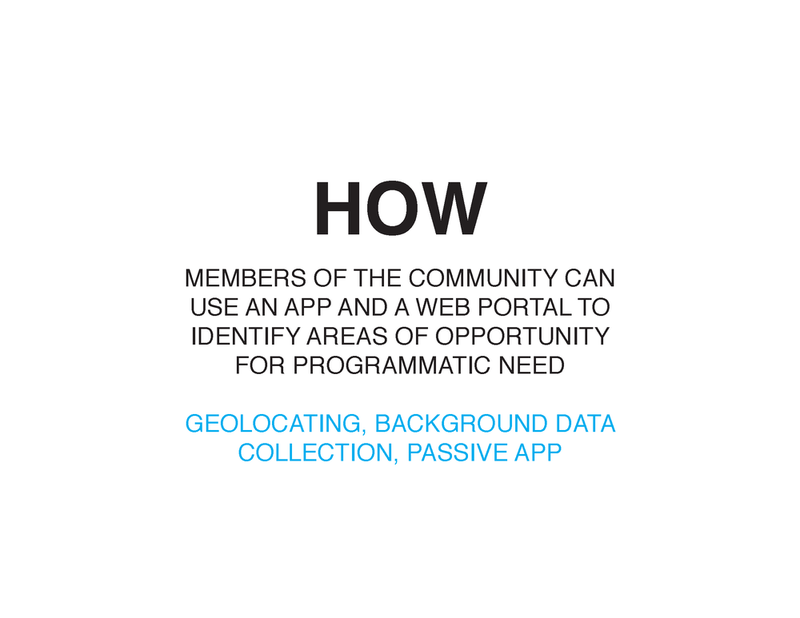 Users of the app would have the ability to document positive happenings in their neighborhoods, as well as areas of improvement. They can event propose new programming in different spaces with an Augmented Reality function. All of this is to close the gap between users and designers, and add communities to the process of design. Strengthened by the clarity between opportunity matched with need and community buy in, design teams would engage meaningfully. For example, competitions for design concepts would be launched with these community-authored briefs - a grassroot effort rather than a top-down result imposed by external interests. Data has the power to be an equalizer in our communities and a source that makes our contributions as architects ever more meaningful. Perhaps it is a revelation to us that we need to be more insistent on inclusivity and engagement. Not only would our app be active in collecting data, but it would also be passive for those that downloaded it onto their phones - for instance, it could collect data on how far they walked to the grocery store or pharmacy or whether there was a lack of a particular resource. Team “Our Town” wants to give the power back to the community. As architects, we recognized that we need to be better listeners and to do that, we first need to design more effective ways to engage with the communities we serve. What better way to listen than to have the community participate and rate the importance of services that might become a reality? Attending the EquityxDesign Hackathon at the 2017 AIA conference was a genius way to get a lot of thinkers in the same room to unpack the issues that plague the architecture and design industry. This was my first AIA Conference. and I attended the conference, in part, to participate in the hackathon.